Living in Amsterdam means that the tourists take over a lot of places, so it’s important to have places that feel like homey and quiet. Some of these spots are barely hidden secrets requiring just knowing where to go while others are truly hidden. If you’re reading this because you’re interested in discovering some secret places to visit in Amsterdam and you’re a tourist, please be considerate. I used to live in a beautiful canal house with a private garden and there’s absolutely nothing worse than drunk tourists ruining a quiet relaxing night in after sneaking into the garden and shouting/blasting music. So, when you pass by someone, say “Goedemiddag” if it’s afternoon or “Goedemorgen” if it’s morning. Just think and please don’t ruin these secret places for me/others. I believe in sustainable tourism, which means that we’re conscious of our actions and its impact on the community that lives at the place that we’re visiting. I’ve grouped the secret places by the part of Amsterdam with some being more further out than others. Some require a half-day trip while others might be right down the road from your hotel in Centre. Visiting some of these secret spots in Amsterdam may be harder as hours are not reliable. This hidden bar in the middle of the Red Light District has a long and colorful history yet it’s right on the main street. Despite this, most tourists walk by it, which is their loss. In ‘t Aepjen is a saying in Dutch that indicates that you spent the night sleeping rough. Where does it come from? This bar. Back in the time of the Dutch East India Company, sailors would return from their voyages from abroad with exotic monkeys and money. The owner eventually had a flea issue and ended up creating what is now the Amsterdam Zoo in order to have a place to put all these monkeys. The bar itself is so cozy and quiet. Close to Centraal Station, you’ll find the world’s only floating cat boat shelter. It was established in the ’60s for cat lovers and it’s actually free to visit (although donations are encouraged). Check the hours carefully as they’re mostly open in the afternoons. There’s nothing like playing with cats to make your day. Click for a complete guide to cat-related places in Amsterdam! This local jenever distillery was established in 1679 and it’s one of the best places to discover jenever and Dutch liqueurs. Click to read about more authentic genever distilleries in Amsterdam to visit! The interior dates back to this time and it’s just really a gem as most tourists don’t know what a proeflokaal is. Big groups are banned and you can buy a bottle of one of your favorites to bring home as well. Read more about Dutch liquors that you’ll want to try while in Amsterdam. I absolutely LOVE this off the beaten path museum in Amsterdam and I drag everyone I know to it. Why? There’s a secret church in the attic!? You can’t even tell from the street. I consider Our Lord in the Attic to be one of the most interesting places in Amsterdam as the museum is actually composed of three canal-houses that were connected (in secret) by a Catholic businessmen at a time when Catholics were not allowed to practice publicly. Beyond the two story church, the furniture and decorations are in the same style as the Golden Age, so you get the benefit of learning about architecture, history, AND religion. It’s never really crowded here, so I recommend using your iAmsterdam card to visit this gem of a museum. This is kind of Amsterdam “secrets” 101, but in case you haven’t heard of the Begijnhof, it’s a hofje in the city center. However, this hofje is fairly well known although compared to the area around it, it’s quiet. ​It was a group of houses where women who were religious and vowed chastity lived out their lives, similar to nuns, however they were able to marry. It even had a secret Catholic church (during the period when they were banned). You’ll need to find the door by the American Book Center. Click for more tips for visiting the Begijnhof! Another half-secret, but bear with me, locals and tourists alike flock to this local Amsterdam bakery that ONLY makes chocolate cookies to order. Click for more information about Van Stapele here! Every cookie will be warm from the oven and when you take a bite, it melts in your mouth.Click for more tips on where to eat in Amsterdam only at local restaurants. Have I outed myself as a crazy cat lady yet? I have no shame in recommending this off the beaten path museum in Amsterdam for cat lovers looking for some weirder things to do in Amsterdam. The Kattenkabinet is a canal house that is filled with cat art AND cats. It’s basically paradise. (More cat-related places in Amsterdam here.) The museum isn’t huge, but a nice way to spend an hour and to get some pets in. Do you go to the movies on vacation? It doesn’t matter because you’ll want to go to the movies JUST to see the gorgeous interior of this Amsterdam movie theatre The interior dates back to 1921 and it cost 4 MILLION guilders to build. It’s just an art-deco masterpiece. For the record, English movies are shown in the Netherlands without dubbing if it’s a non-children’s movie. I so recommend the Grote Zaal (the largest theatre), which is extra beautiful. Hidden within a small crack in the Jordaan, you’ll find the tiny hidden houses of Amsterdam. They were installed in a crack of a wall as a joke in reference to the closed-up courtyard, but they’re delightful and difficult to find. It’s a small delight. This is a pretty random factoid, but the building was the headquarters for the Dutch India Company for many years. It’s actually where the Dutch decided that they’d conquer New York City (my hometown). It’s easy to pass by the Walloon Church along Oudezijds Achterburgwal without a second thought, however this church dates back to the 15th century and it has been in active use since 1586. Vincent van Gogh attended sermons here. The square here is full of gorgeous buildings and you can head to Oude Hoogstraat to find the old entrance to the church used for funerals. The church is free to visit when open although please be respectful as this is a religious space. The organ created by Christian Muller is one of the best-preserved organs still in existance. The Dutch are really into having green zones within a city and having a place for children, so a lot of Dutch cities have these children’s farms in the middle of the city. If you’re looking to say hi to some adorable bunnies and sheep, I definitely would add this non-touristy activity in Amsterdam to your bucket list. It’s free to enter besides a donation (it’s run by volunteers). Despite being part of Centrum, Prinseneiland and Realeneiland are some of the least visited parts of Amsterdam, mostly due to the big ugly tunnel that you need to pass through to get to the pretty parts. (It terrifies my friends too.) These artificial islands known for shipbuilding historically got turned into an artist neighborhood in the ’60s. It’s still full of many studios as well as historic warehouses, adorable one-lane bridges, and even a petting zoo (above). Click for my guide to the Western Islands! The Willet-Holthuysen museum also has a beautiful garden. The museum is quite lavish and well represents what life was like back in the Golden Age. It’s included in the iAmsterdam pass, so if you’re a history geek, I think this lesser known museum is worth a visit. For a more complete guide focused on the Jordaan, click for my self-guided walking tour of secret spots in the Jordaan with my favorite hofjes and streets. Karthuizerhof is the largest remaining hofje in the city and it’s actually a private residence. This one is much less known than the Begijnhof, so please don’t ruin this one. This is where you’ll often find me with a book or sitting petting the friendly cats that roam the place. I loved it so much that I took my wedding photos here. NOTE: Most hofjes, including this one, are private residences that kindly allow the public inside. If you’re rude/loud/inconsiderate, you will be asked to leave and I’ve seen it happen. 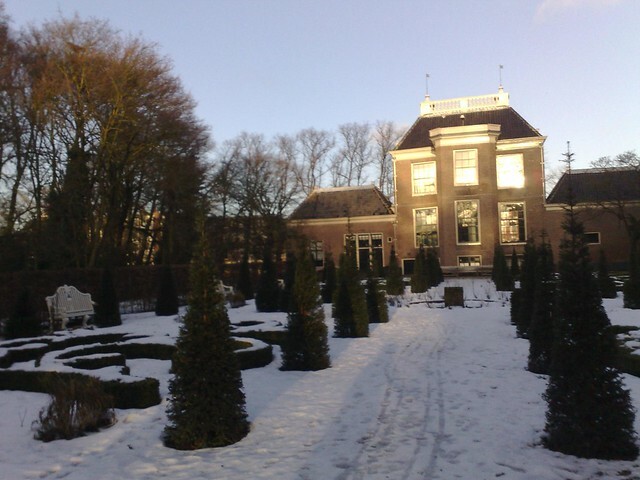 The hofje closes around sunset. This charming hofje in the middle of the Jordaan has irregular hours, so very few people end up visiting. I have tried many times to get inside, however I finally managed on a weekday during the day. It’s not particularly large, but it’s cute. Same rules apply: Be considerate, quiet, and polite. Can you tell that I love hofjes? They’re historical, beautiful, and it’s never a guarantee that you’ll get inside. (Living on the edge!) Although this one was originally named after the seven original houses, it was expanded. It’s actually social housing as it was intended to be years ago. It’s said that the Raepenhofje is one of the oldest hofjes in Amsterdam dating back to 1648. It was used for widows and orphans. There’s not much to mark it besides a circle above the entrance, but this small hofje is just cool to walk into if you’re already in the Jordaan that is still owned by the descendents of the original creator. The door is sometimes open; sometimes shut. It’s very small, so be quiet and considerate. It’s said that Cafe Chris might be one of the oldest cafes in Amsterdam (350 years old). Either way, people who love dive bars in the US will fall in love with the dark and historical interior. The bartender is delightful and the people are always fascinating. It’s cash only and also, you can’t sing in the bar. The view and the beer selection is pretty decent (although more classic). If you’re into beer, don’t miss this incredible bar in Amsterdam.Click for more tips on Dutch liquor you’ll want to try and the best beer in Amsterdam. This leafy park close to University of Amsterdam has a gorgeous mansion and the first time that I first passed it, I did a double take. I consider this one of the bigger secret places in Amsterdam that most people don’t know about it although it’s perfect for a nice walk, especially in summer. If you’re staying out in Amsterdam Oost, definitely stop by if you’re biking by. You’re probably used to hearing about people doing canal tours in Amsterdam. 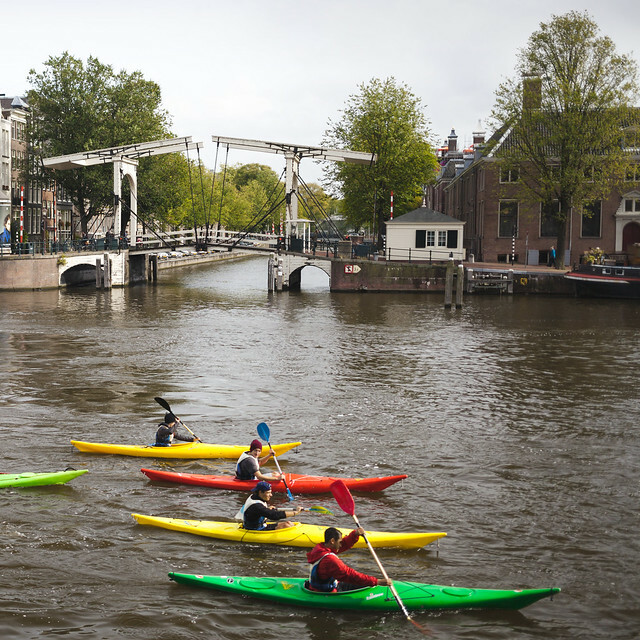 However, did you know that you could do stand-up paddling or kayaking in Amsterdam IN THE CANALS? Although I generally avoid swimming in the canals, this experience is just too unique to pass up. I ended up doing kayaking at Camping Zeeburg, which is a bit further out of the city, however you can do both closer to the city with one of other companies. Just check the location FIRST as some are quite a bit away from the canals [including Camping Zeeburg], so you’d need to kayak half day in order to do it around the canals. Can you visit an old Dutch village while staying in Amsterdam proper? YES. Ransdorp is a cute Dutch city surrounded by farmland with a Gothic tower. It’s perfect for a long cycle if you don’t plan on leaving Amsterdam, but you want to experience the more rural side of the Netherlands. It’s definitely one of the non-touristy things to do in Amsterdam and a secret spot in Amsterdam that even Amsterdammers don’t know about. In order to get here, you need to bring a bike with you on the ferry to Noord Amsterdam. Click for my guide to Ransdorp! This squat turned artist space and restaurant is definitely a secret spot in Amsterdam. You enter through a nondescript door on a major street. Suddenly, there’s tons of street art and inside, there’s a no-waste restaurant run by volunteers (reserve ahead). I love the atmosphere as it’s really what is fading from Amsterdam nowadays as overtourism means that more of the city becomes one for visitors rather than residents. The food at De Peper is really good. 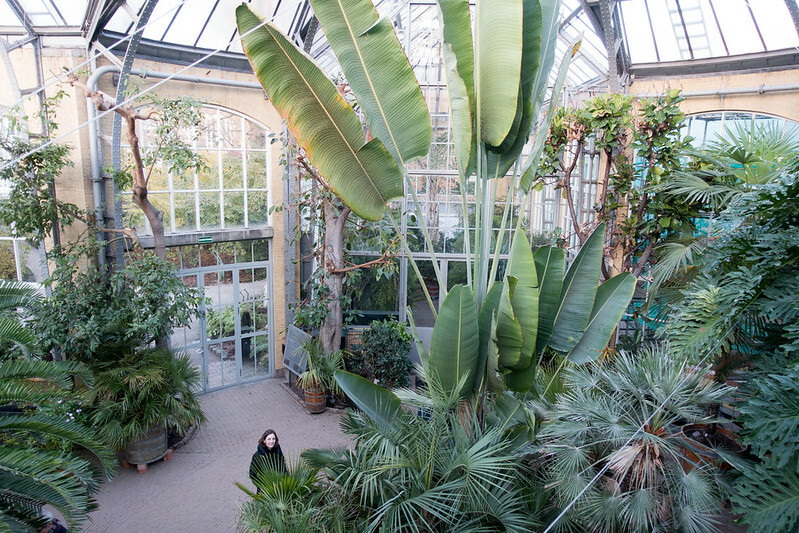 The Hortus Botanicus is one of the oldest greenhouses in the world. Established in 1638, this Amsterdam greenhouse was used for growing medical plants for doctors and pharmacists. The intended use was to find medicines to fight the plague, however with the growth of the VOC (Dutch East India Company), many exotic plants were brought back to Amsterdam. Many credit the Hortus Botanicus for producing the coffee strain that is used all over the world now. Noord Amsterdam, specifically NDSM, feels very divorced from the historical city of Amsterdam. Full of modern buildings, old warehouses (more recent), and graffiti, NDSM feels younger, more vibrant, and (don’t judge me) like the cousin of Williamsburg before. This area is rapidly changing as hipster turns into yuppie, but for now, it’s still a great area. Be sure to head to the IJhallen if you can be here! Click for my guide to NDSM/Amsterdam Noord. This converted coal factory in Amsterdam West was renovated in 2003. This sprawling (and surprisingly beautiful) complex has blossomed with small businesses, start-ups, and cafes. I particularly love coming here for the Sunday Market where you can get artisanal goods and to stop off at Tony’s Chocolonely for …a few Amsterdam slave-free chocolates. During December, there’s a great Christmas market held here! Amsterdam’s epic street food festival is held in Westergasfabriek in summer. Anyways, this factory is housed in one of my favorite parks in Amsterdam aka the one that all the tourists in Amsterdam skip! I often come here to picnic in the park after getting lunch in Westergasfabriek, making it a great place to visit in Amsterdam, especially in summer, if you’re looking to do some non-touristy things. De Otter is a Rijksmonument windmill IN Amsterdam dating back to 1631. This windmill is the last remaining saw mill in Amsterdam and it was restored in the 1990s. It’s not possible to visit this windmill, however you can view it from the sidewalk/bike path along Buysbrug. Have you been to any of these interesting places to visit in Amsterdam? Any other favorites? Best photo spots in Amsterdam. Heading to Amsterdam in a couple weeks. I knew I had to check out your blog to scoop the secret places. Thanks! Booking marking as I am meant to be in Amsterdam in April. First on the list will be those cookies before I hunt for any of the secret places as I have such a crazy sweet tooth. I’ve only been to Amsterdam once, but I find that with most big cities, the more you visit the less you have to do the touristy stuff and the more you fall in love with them. Some great tips! Im planning to visit amsterdam again when i attend Traverse this year! So I’ll be checking some of these out! Wish I had known about this list before my last Amsterdam trip, but now I saved it for when I go back! Definitely want to go kayaking and check out the Tuschinski theatre! Have you had Surinamese food (broodje pom, i.e.) there yet? It’s my favorite! Beautiful post and the story about the monkeys and ‘t Aepjen is interesting. I’m glad that they wound up in the zoo. I’ve read a lot of Amsterdam posts but this one is a great perspective on things I’d like to go see. Thanks for sharing, you’re a great writer! I love a local’s perspective and would love to go kayking or explore our Lady in the Attic musuem and see the secret church. Such neat finds that are a refreshing change from the traditinal Amsterdam fare. Great share! What a great list, I don’t think I’ve been to any of these before! Definitely some great inspiration for my next visit to Amsterdam. Great guide, even for Dutchies. Bookmarking this! One translation thingy: It’s the Sweet Lord in the attic instead of a Lady! Thanks for the tip Wendy. (I’ve been mistranslating it for a while) Glad to hear that you enjoyed it and let me know your favorite secret places that you visit! Thanks – I’ve been to Amsterdam many times (15+) and while I knew about some of these, you have several new to me. Hup Holland! What about parking situation in Amsterdam? Street parking in Amsterdam is regulated by permits and difficult. You’ll generally need to park at paid locations, such as Q-parks. I recommend getting rid of your car before going to these locations as many are on one-way streets with no parking for visitors. Don’t forget to visit Museum Het Schip (“The Ship”), a beautiful hidden jewel behind the Westerpark. The museum is established inside an appartment complex build between 1919-1921 in the Amsterdam School style, a style inspired by the Art Deco and Jugendstil and a reaction against industrialisation. The appartment complex was build for the working class, and even more specific for the socialist workers here in Amsterdam. The museum is small, but to compensate you can join a tour that is included in the ticket price. The guide will take you around the building and show you places that are otherwise closed for the general public, like an original post office and museum appartment with an original 1920s interior. If you are interested in architecture and the history of Amsterdam and want to visit a museum that is still unknown even to locals this is the place to be! Thanks, Karen – for sharing the great post. The information is really noticeable. I love to travel a lot and you give me another vice reason. Once again thanks a lot, and please share another post very soon as I am waiting to read out another wonderful post so that I can update my travel list. Would you recommend buying tickets to Our Lady in the Attic museum before a trip online? Are tickets more exspensive online vs in person? I plan on visiting the beginning of May and want to make sure I visit it. You can check my dedicated post for more information about visiting Our Lady in the Attic, however you don’t need to worry much about lines or them selling out! I’d buy them there when you go.